When I got an e-mail from Urban Outfitters yesterday, I didn’t bother to open it. I was still turned off by an Urban Outfitters shirt that my friend brought to my attention earlier this week. 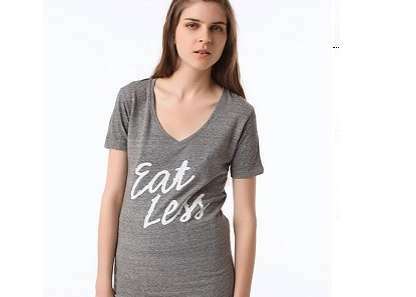 The shirt says “Eat Less” and is modeled by a skinny girl who looks like she could stand to eat more. One of my friends said the “Eat Less” shirt is mocking skinny hipsters and isn’t meant to be taken literally. Even if that is the case, the shirt still sends the wrong message. Impressionable young girls already have enough places to go for “thinspiration“; they don’t need a shirt to reinforce what they’re already telling themselves to do every day. Eat less and you’ll be skinnier, prettier and more popular with the guys. Eat less and you’ll feel better about yourself. Eat less and you’ll be the envy of all the girls. No doubt, the shirt could be offensive to people of all shapes and sizes. Urban Outfitters has some cute clothes and accessories, and I occasionally buy merchandise from there. But for now I’m turned off by the store and the message it’s sending. It’s safe to say I don’t plan to buy the store’s clothes, or heed its unsolicited nutritional advice, anytime soon. Thanks for posting this! I can’t believe that in today’s society where models are starting to look slightly healthier (at least in my opinion) and companies make a little more effort with their model choices that a store would come out with a shirt with such a slogan. I generally love Urban Outfitter’s clothing but I might think twice next time I go out to shop. It might be intended for mockery but the shirt is just plain inappropriate and sends the wrong message to women and girls who are already overly body-conscious. What was Urban Outfitter’s thinking? I work in a OB\GYN office. Part of my job is to release medical information to fertility centers. Some of these woman are very under weight, and suffer from eating disorders. Many women just want to be happy, and like what they see in the mirror. It’s all about eating in moderation and fueling our bodies, so we can acheive our goals in life. Women have enough to think about, they don’t need others thinking for them.